Goal: To design a robust control system which dynamically maintains the steel ball in a quasi-equilibrium position over an oscillating plate (2-DOF) with minimum position error. The ball can either remain at a fixed reference point or it can trace a pre-determined path. 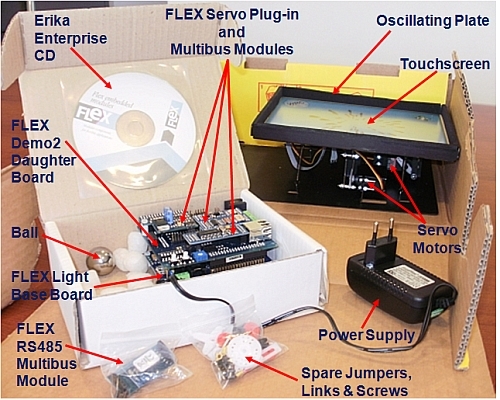 Means: Using a Ball & Plate system with servo motors and touchscreen; powered by opensource mathematical control tools and SCICOSLAB to evaluate and implement feedback strategies such as PID, LQC, H infinity, fuzzy, neural nets, adaptive or nonlinear controllers. The hardware comes with an installed demo program and it also has a dedicated power supply. Hence, the user can immediately run the system by connecting the power plug and at the same time check the system characteristics by connecting the hardware to the PC via an Ethernet cable.